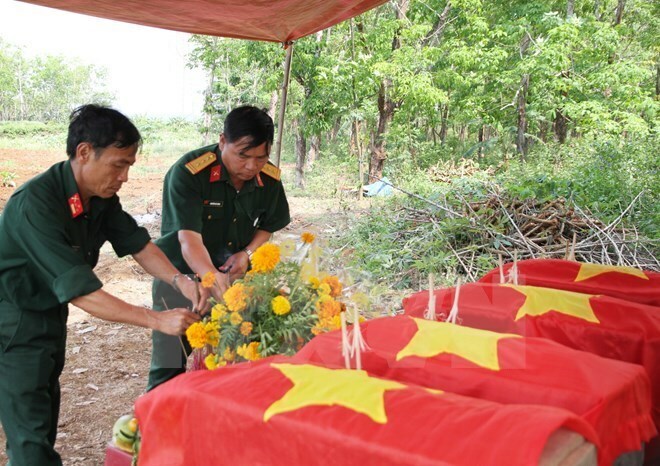 Quang Binh (VNA) - Thirty five sets of remains of Vietnamese volunteer soldiers and experts who died in Laos were reburied in a martyr cemetery in Bo Trach district of the central province of Quang Binh on May 11. The remains were collected by Team 589 of Quang Binh’s Military Command in Khammouane province during the 2015 dry season. It was the 37 th time Quang Binh province had received the remains of fallen soldiers from Laos. Speaking at the reburial ceremony , Somchay Phetsinouane , Vice Governor of Khammouane province and Head of the provincial Special Task Board, affirmed that the Lao people forever remember great contributions of Vietnamese volunteer soldiers and experts to their country’s independence. Vice Chairman of the Quang Binh provincial People’s Committee Tran Tien Dung also highlighted the services of the martyrs, who sacrificed their lives for the independence and freedom of Vietnam and Laos.